If you want to see some of the most beautiful and inspiring palaces in Germany, then surely you should not miss Saxony. Here are concentrated amazing medieval castles such as those in Dresden and on the Elbe, like the Moritzburg Castle and Rammenau castle. Particularly impressive, however is Kriebstein castle, which dominates over the river Zschopau. Many people define this medieval structure as "the dream of a knight. Moreover Kriebstein castle is considered to be the best preserved fortress in the Saxon lands of Germany. Perhaps the reason for this lies in the location of the castle, which dominates the surrounding area from a high cliff. In practice Kriebstein was impregnable in the troubled medieval years. Kriebstein is considered the most handsome knight castle in Saxony. It has a Gothic hall, a chapel, wine cellar, deep dungeon, loft and tower, living quarters, and the iconic "Kriebsteinzimmer". This area was built in the 15th century and is a perfectly preserved room with wooden sides. 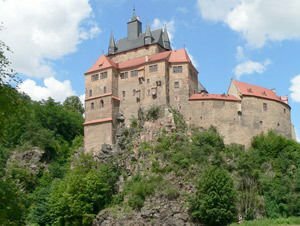 Kriebstein castle is one of a kind and a jewel of Gothic architecture. The unique residential tower of the castle reaches a height of 147 meters, and has six skylights. This tower was built in the first half of the 15th century and was home to the first owner Dietrich von Beerwalde for about 600 years. This is when Kriebsteinzimmer, was built around 1423. The chapel in the castle dates back to1410 and here can be seen striking scenes of Mary and a brilliant Alexius Altar. In 1986 the chimney of the castle was opened, a great treasure that is now exposed and can be seen by everyone. Currently Kriebstein castle is used regularly for various cultural events, medieval and music festivals, rock concerts, chivalrous meetings etc.